If you have a bookworm in your family, ebooks can be an expensive habit. Fortunately, there are great places to find free versions of many popular titles. Some are available to keep; others you can borrow. There's a fairly large collection of public domain and other free works available on Amazon, including The Ugly Duckling, Bobbsey Twins in the Country and The Adventures of Tom Sawyer. But finding free titles isn't easy, so you'll want to head over to a book-finder site like Freebook Sifter, which has more than 600 children's ebooks catalogued. Titles are broken down by age and type and are listed with the average Amazon rating. FreeReadFeed provides a similar service, with the ability to sort by Children's and Teens. Neither site has a complete list, but they're both great places to start. If you're an Amazon Prime member, you can borrow one book a month for free from Amazon. There are books for young children, like Dora's Sleepover and Goodnight, Little Monster, as well as tweens and teens who are ready for books like the Harry Potter series and The Hunger Games. 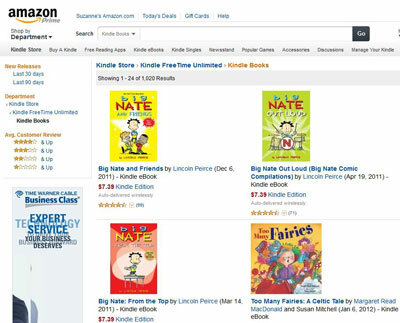 While not free, those with a new Kindle Fire can subscribe to Amazon's Kindle FreeTime Unlimited, which provides access to more than 1,000 books suited to kids ages 3-8. It's bargain-priced at $4.99 per month, or $2.99, if you're an Amazon Prime member, and includes access to free videos and apps. 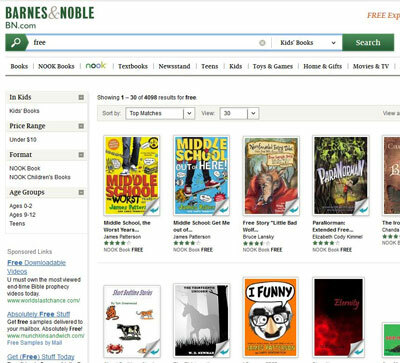 The easiest way to find free kids books for the Barnes & Noble Nook is to go to the Kids section and search for "free." This will pull up more than 4,000 titles. The selection is heavily weighted to tweens and teens, but there are some titles for younger children, including one of my favorites, The Elephant's Child. You can check out eBooks from your local library with your library card just like you can physical books. Some libraries offer ebooks directly, but most use a service called OverDrive. To find out if your local library participates, just plug in your ZIP code. Even if your library doesn't participate, you can usually find one in your state that will lend to you. To read an eBook provided through OverDrive, you'll need to download the app, which is available for Windows, Mac, Android, BlackBerry, iOS and Windows Phone devices. Once you've input your library card information, you'll be ready to borrow. The best part, there are no returns. Books simply disappear off the reading list once they hit the due date. The selection of books available will vary, but you will find great books. For instance, Judy Moody and the Bad Luck Charm, Are You My Mother? and The Lightning Thief are currently available for lending at my library. The next time you're thinking about forking over $5 to $10 for an ebook, take the time to check out what's available for free. You'll be pleasantly surprised at what you find.